On Friday, Research Intelligencerpublished a back-of-the-envelope analysis calculating the “hourly rate” Madison Avenue pays American consumers by underwriting the cost of the ad-supported media they access and consume. It turns out to be a nice round number: $1 per hour. Today we’re following up with a more granular analysis analyzing the hourly rate based just on the advertising time, extracted from the content. 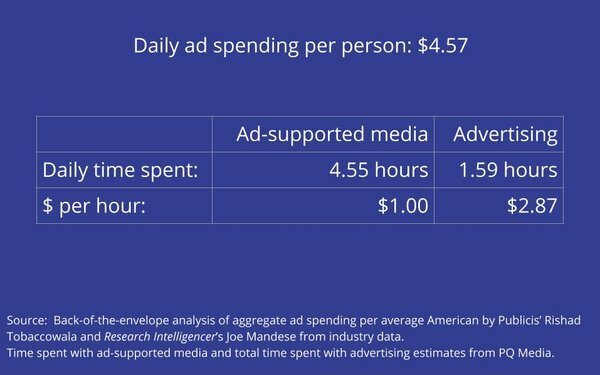 Based on estimates that PQ Media calculated for Research Intelligencer, the average American is exposed to 1.59 hours of advertising time daily, making the hourly rate of advertising exposure $2.87. Remarkably, these estimates are the first of their kind to calculate the amount of advertising exposure and advertising spending in the most human of terms -- the value exchanged with the humans who are being exposed to the ads. Needless to say, most of that value isn’t being paid directly by advertisers to consumers, but comes in the form of underwriting or subsidizing the ad-supported content they would otherwise have to pay for. The analysis was triggered by Publicis Groupe Chief Growth Officer Rishad Tobaccowala’s recent projection that the supply of consumer attention to advertising will decline 20% to 30% over the next five years, mainly because consumers are shifting their attention -- and pocketbooks -- to subscription-based media such as Netflix that has no advertising in it. We’ll publish a follow-up analysis with Tobaccowala in tomorrow’s edition explaining the math he used to derive those projections. Friday’s report generated some interesting reactions from readers. Either way you look at it, the value is considerably less than minimum wage: $1 per hour for ad-supported media, or $2.87 for pure advertising time. It’s also a lot less than most consumers would say is the value they would expect to receive for their time, suggesting that core of Tobaccowala’s thesis is indeed correct. 3 comments about "Spending Per Person/Hour: Advertising, Ad-Supported Media". Joe, being "exposed" to media content occupied by advertising may account for 1.59 hours per day for an average American according to PQ Media, but that does not mean that the ads were given any attention nor, in the case of TV, does it mean that the "viewer" was even present when the commercial was on the screen. We simply do not have any measurement of ad attentiveness across all media. But if we did, rest assured that the figure would be very much lower than 1.59 hours a day per persen. Joe Mandese from MediaPost, April 2, 2018 at 12:20 p.m.
@Ed Papazian: Don't disagree with you. The article doesn't equate that time with "attention," just the amount of time the "average American is exposed to" advertising daily, according to PQ Media. Craig Mcdaniel from Sweepstakes Today LLC, April 2, 2018 at 3:26 p.m.
Joe, I have reasons for supporting a hourly rate based system for another reason. I want to directly work through a honest broker of the ad agencies and advertisers instead of Google and the RTB's. I want to go back to a more free market way of doing business where I can make money again. What this means is in 2011 my company was getting paid by Google on a daily average of about $350 to $425 a day. For 2018, we are averaging less than $60.00 per day. In short, there are hundreds of publishers in the same boat as I. The publishers need something better than what we have now.